act one was created several years ago by Josh Brown and Andy Pugh. Since then act one has undergone several changes. Josh is no longer with act one and neither is Andy, although we do remain friends and in close contact. The entire premise behind act one is a group of friends with common interests getting together to have a good time. act one is a small club but we have a good time we get together at least once a month and go to several shows every year. Many of our members have claimed trophies at large advertised events such as West Coast Nationals, Truck Jamboree, and Spring Splash and not to mention the many smaller events that members have claimed trophies at. Josh, Andy, Dave, and Donald have all had their trucks in Mini-Truckin magazine and several other members have been in background shots. If you are interested in joining act one we welcome all newcomers. We do have a few vehicle requirements. Click here to find out more about those requirements. We offer a drug free, pressure free, FUN environment. act one considers all members equal and we only have officers out of necessity due to S.C.M.T.C. rules. act one meets on the first Sunday of every month at Stadium Pizza in San Jacinto Ca. at 6:00 p.m. Click here to see a map. 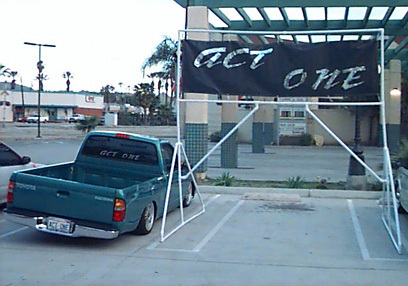 act one is a member of the Southern California Mini-Truck Council and we promote all council events and by-laws. act one wants to hear your comments E-Mail us!